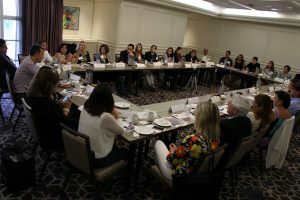 Human Resources Connections: Role Clarity - WorldCity, Inc. Discussion leader Dr. Ilia Rodriguez-Torres shares her experiences with role clarity. Click here to register for WorldCity’s HR Americas Conference on September 28-29. People may not be clear on the purpose of their role. When people aren’t clear on that, conflicts rise and can result in some trying to take power into their own hands. 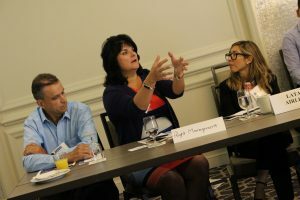 Discussion leader Ilia Rodrogiez-Torres, Ph.D. emphasized the importance and impact role clarity can have on an organization from the outset of the latest WorldCity HR Connections. Rodriguez-Torres serves as regional senior human resources director for Latin America and the Caribbean at Ferring Pharmaceuticals. She’s also served as a speaker in various forums in Florida, Puerto Rico and Panama and authored the book Role Clarity in Organizational Design. Karen Saravia (left) from Tiffany and Co. and Isabel Montes (right) from Starbucks share a laugh at HR Connections. Click here to see the Facebook Photo Album from this event. Rodriguez-Torres explained the concept of finding the “work driver” in each person’s role within the company. Part of a chef’s role is to keep the kitchen stocked with food, but that’s not his work driver. His work driver is to cook amazing food. Ultimately, that is what adds value to the restaurant. The work driver is the activity that connects directly to how the company makes money. 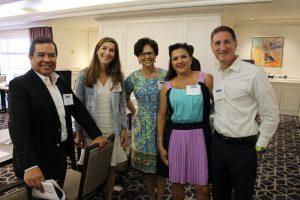 Every seat taken at the latest HR Connections in Coral Gables. “People typically think about roles in the form of a job description,” said Rodriguez-Torres, but she said she typically doesn’t use that term, in fact she wants to get far from it. People don’t like them and even, sometimes, go to HR asking for help writing them. “Nobody takes the time to think about (job descriptions), to have clear expectations, to recruit the right person, to train the right person, to motivate, to compensate, to develop, and at the end of the day, when that person leaves the company, proud of what they did and their contribution to the company,” said Rodriguez-Torres. If you are able to help people draw out their department’s core process and explain it in a way that’s easy to understand, you’re gaining a manager that can recruit, train and supervise. That then allows the core process of one department to connect more easily with the core process of another department. In Rodriguez-Torres’ experience at a former company, failure to implement this meant a mortgage application getting sent to a second department, but that application sitting inactive for weeks. After the core processes were drawn out for each department, mortgages were processed at an amazing rate, more people bought homes, which led to a large increase in morale for employees to be part of such a rewarding experience in the lives of their customers. Tammy Davidson from Right Management shares her thoughts. If managers and executives show enthusiasm for role clarity and drawing out departments’ core processes, there is often trickle-down effect to the rest of the employees. Several examples were shared around the table. Tammy Davidson, senior vice president of client services at Right Management, shared the story of how the director of finance of more than 40 years at FPL would always go to the office in the middle of a hurricane. Did this executive have anything to do with getting customers’ power turned back on? No, but his support for the core process of another department galvanized employees. Edvard Philipson, Rodriguez-Torres’ boss, attended the event to support and listen to his HR Director. He is vice president for Latin America at Ferring and shared what he learned about Sweden’s corporate culture (Ferring is a Swedish company), where they utilize flatter organizational structures and function much more democratically with ample of discussion on the purpose of each individual. Philipson also noted the positive experience of employees in smaller business where the owner is active in decision-making. 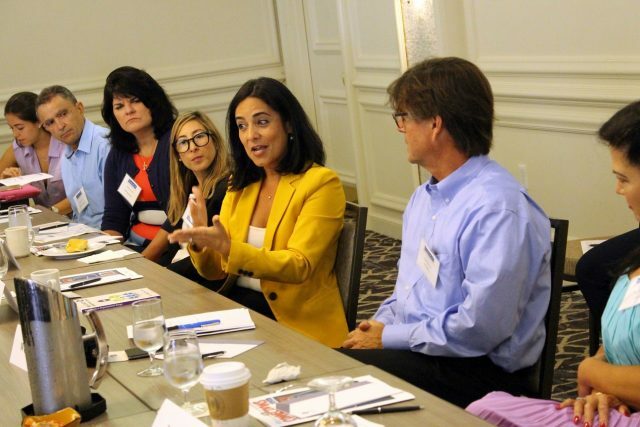 Rodriguez-Torres shared her experience of the Ritz Carlton empowering employees to exercise their roles. The general manager was the one greeting guests as they walked in, asking those sitting in the lobby multiple times if she could get them anything. When asked, the valet said he loved working for this general manager, because she works so hard and cares so much. It trickled down to the valet and more. Generally, in a company with more than 1,000 employees, in each department, there should be no more than three or four roles, said Rodriguez-Torres. Sometimes supervisors like to hide behind the word complex. They’ll say a role or a duty in their department is too complex for another employee to understand. That is part of someone not being clear on their level of authority for a company-wide project. It should be specifically communicated that they are not allowed to change it. The next HR Connections will be August 25. Click to register today for the 5th annual HR Americas Conference by WorldCity, to be held September 28-29!